When coding a document segment, you are attaching a segment of a text or image to a code in the “Document System.” MAXQDA also allows you to assign a weight score to each of these coded segments to indicate how important that particular coded segment is. It may be that certain coded segments represent a typical argument or theoretical concept that you want to be sure and hold on to. In this case, these segments are a sort of signpost. MAXQDA allows you to indicate how important or appropriate a segment is for the code it is coded with by giving it a weight score between 0 and 100. This weight score could be described as a “fuzzy variable,” because it is not meant to give an exact numerical worth for the segment. Rather, it is intended to be a guide, so you can later sort your retrievals based on the weight assigned. Code weight scores weights can later be used as a sorting criterion for the codings and in numerous analysis functions as a selection criterion, that is, the analysis then only refers to the coded segments with a specific weight. Every newly coded segment automatically receives the default weight score, which is somewhere between 0 and 100. In the status bar at the bottom of the screen, by clicking on the Default weight icon. 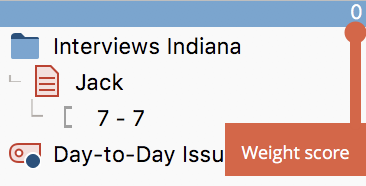 A dialog window will appear where you can set a new default weight value. The current value is always visible in the status bar. The weight of a coded segment is shown in the top right of the info box that appears next to each retrieved segment in the “Retrieved Segments” window. The display of weight scores in your “Retrieved Segments” can be managed in the settings of MAXQDA, which you can accessed via the gear symbol at the top right of your window. The “Overview of coded segments”, available for document groups, each individual document, and the whole project, also includes the weight scores for each coded segment. When coding, the default weight score is always set automatically. A different weight score can either be assigned in the window “Document Browser” in the “Retireved Segments” window or in the “Overview of Coded Segements”. Please note: How you choose to use different scales of weights is up to you. You could make a ranking list with a highest score of 1, or a highest score of 100 for particularly important segments. Right-click on the coding stripe for the coded segment that you would like to alter the weight score for. You can then enter a number between 0 and 100. 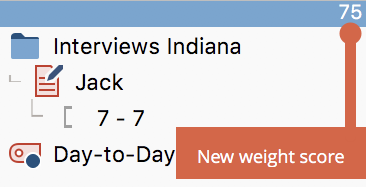 A weight score can also be assigned and modified in the “Retrieved Segments” window. Right-clicking anywhere on the information box left of the coded segment opens the context menu, where you can select Modify weight and enter a number between 0 and 100. You will be able to see the newly-entered weight score in the top right of the info box with the blue header directly after you make the change. In the “Overview of Coded Segments” table, you will find a column for the weight score of each coded segment. By double-clicking on a cell in the column, you will be able to enter a new weight between 0 and 100. Tip: You can also adjust the weight for several coded segments in the “Overview of COded Segments”. To do this, select all the coded lines whose weight you watn to change, and by right-clicking on the segement to open the context menu, select the change weight entry.